As people across the Carolinas start the process of recovering from Hurricane Florence, we want to remind everyone to be cautious when contributing financially to disaster relief agencies, and to protect yourselves from the financial scams that typically follow these types of events. Anyone seeking to help aid in the recovery by contributing financially to disaster relief efforts should ensure that their donations are made only to valid and reputable organizations using well-known websites, apps and payment methods. Fortunately for those in need, there are many valid and trustworthy organizations seeking to help people and areas affected by the storm. Unfortunately, there are also people who seek to profit and take advantage of anyone willing to help, and caution is required in order to protect yourself from hackers and malicious scams. Observations following past adverse weather events and natural disasters have shown a marked increase in malicious scams designed to defraud contributors, steal financial information, and infect users with malicious software and computer viruses after a disaster like Hurricane Florence. We want to caution the UNCG community to be wary of these scams, and provide resources to help you contribute to valid agencies. The Multi-State Information Sharing and Analysis Center (MS-ISAC) warned in an advisory on Friday that arrival of Hurricane Florence is expected to “propel the emergence of new and recycled scams involving financial fraud and malware.” Likewise, North Carolina’s Department of Information Technology has also warned computer users of phishing expeditions tied to the disaster, as has the Department of Homeland Security’s threat-sharing center. Email and website phishing and other financial scams associated with special events like named hurricanes are often very successful because they prey on people’s altruistic desire to help others which is naturally elevated after a disaster event. Given that hurricanes are one-time events with unique names such as “Florence,” people may expect new websites to be created for them. Users should be cautious about where and how money is sent, and contribute only to well known disaster relief organizations such as the American Red Cross, The Salvation Army, United Way and Samaritan’s Purse using well-known methods. Be cautious of any online fundraising efforts that are not associated with well-known disaster relief agencies. Do not click links in emails offering to help you donate money to hurricane victims. Be suspicious of unexpected social media pleas, phone calls, text messages, donation websites, and/or door-to-door solicitations claiming to raise funds for hurricane victims. Heed the advice of the Federal Trade Commission when it comes to Wise Giving After a Hurricane and How to Donate Wisely and Avoid Charity Scams. Contact 6-TECH at 336-256-TECH (8324), 6-TECH@uncg.edu, or https://6tech.uncg.edu for help with any emails or websites you feel may be malicious. Please protect yourself and your financial information throughout the recovery effort to ensure that aid arrives where it is needed most. Copy provided by Bryce Porter, UNCG chief information security officer. The NC Department of Insurance Assistant Director of Public Affairs will sponsor a live fire sprinkler demonstration at UNCG. This safety demonstration is slated to occur Wednesday, September 19, from 11 to 1 p.m., with the actual demonstration fire to occur at 12 noon. The safety demonstration, showing the importance of sprinkler systems, will take place at the Traffic Circle behind Jackson Library. Questions? Contact Erin Price-Erwin, Fire and Life Safety Manager in Environmental Health and Safety, at 336-334-4357. The Elliott University Center will host its first Red Cross Blood Drive of the 2018-2019 academic year on Tuesday, September 18, from 8:30 a.m. to 6:30 p.m. in Cone Ballroom. Schedule your donation appointment today and help the EUC reach its 300-pint goal. For those wishing to make a Power Red donation, the Red Cross is currently accepting only blood types A negative; B negative; O positive; and O negative. Be sure to come prepared when giving blood. Have a light meal and plenty to drink. Bring your Red Cross donor card (optional), and a photo identification (Spartan Card accepted). And bring the names of any medications you are currently taking. For more information on giving blood, and to schedule your donation appointment, visit http://euc.uncg.edu/mission/blood-drive/. Appointments will be given priority. Walk-ins are welcome. The Office of Undergraduate Admissions launched an updated website on Monday, Sept. 10. The new site includes improved functionality, including a mobile-friendly design and an updated look in line with the newly refreshed brand. Please note: If your website links to any pages on the Admissions site (including application requirements, majors and minors list, or tour/event information), the URLs have changed. Please update the links as soon as you can to ensure students and visitors are directed to the correct information. The 2018 Nano Manufacturing conference will be held at the Joint School of Nanoscience and Nanoengineering (JSNN) on the South Campus of Gateway University Research Park in Greensboro Wednesday, Sept. 26. The primary goal of the conference is to bring together founders, CEOs, senior executives, business leaders, economic developers, educators and government and nonprofit organization executives to share their vision for the future and the opportunities that Nano Manufacturing enables. “This conference is a real opportunity for those interested in learning more about advanced manufacturing technologies and how the application of these new technologies can help grow the manufacturing sector in North Carolina and the US,” said Joe Magno, executive director at The North Carolina Center of Innovation Network (COIN). The UNCG College of Visual and Performing Arts will host an Arts Summit Thursday, September 13. The theme? Art as political action. The keynote address will be presented by Lorena Wolffer, a Mexico City-based artist and cultural activist. Her artwork addresses gender and women’s rights, and she has produced and curated a number of artistic projects with other artists across multiple mediums. Her work is a powerful voice for equality and cultural change. After the keynote, there will be a discussion hosted by a panel of artists from across the country, followed by a workshop, of which there are three choices. The summit starts at 9 a.m. at the UNCG Auditorium on Tate St. After a lunch break, the summit will move to the EUC for workshops. Attendance is free, but please RSVP by September 10. For more information and the full schedule, as well as to RSVP, see the CVPA website here. Faculty Senate meeting today (Sept. 5) at 3 p.m.
UNCG’s Faculty Senate will hold its first meeting of the academic year. The meeting begins Wednesday, Sept. 5), 3 p.m., in Alumni House. Chair Andrea Hunter and Provost Dana Dunn will give remarks. Alice Haddy and Ian Beatty will lead a discussion on the General Education Task Force. Vice Chancellor for Student Affairs Cathy Akens and Director of Admissions Chris Keller will speak on the Incoming UNCG Student Profile. A discussion on BOG AP Policy for Rewarding Undergraduate Course Credit will be led by Associate Vice Provost Jodi Pettazzoni. A Constitutional Review and Update will be led by Stephen Yarbrough. In the second hour, unit delegates will have have a round table, and then Chair-elect Anthony Chow will speak on Social Media. The dean search for the School of Health and Human Sciences is ongoing. The search committee will review a new set of candidates early this semester with the goal of hosting campus visit later this semester. Dr. Dave Demo has served as interim dean of HHS since July 1. Health Medicine Network featured a piece on a presentation on relative age, at which Dr. Matthew Hughes was a presenter. Dr. Jiyoung Hwang spoke to Fox8 about brick and mortar store closures. The article. UNCG’s new Spartan and brand refresh was featured in publications including MyFox8, Spectrum News, and The News & Record. Kristi Reese (UNCG Police) has received the 2018 D. Stafford & Associates Excellence in Clery Compliance Award. The award recognizes outstanding contributions of a current practitioner who is transforming Clery compliance on their campus and/or the field through exceptional programs, processes, scholarship, innovation and/or service to the field or industry. The Jeanne Clery Disclosure of Campus Security Policy and Campus Crime Statistics Act (Clery Act) is a consumer protection law that aims to provide transparency around campus crime policy and statistics. The act was enacted in 1990 to educate individuals about the safety of the campus they are interested in, whether it be for employment or higher education. Reese received the award at the 5th Annual NACCOP Conference Recognition Ceremony on July 20 in Baltimore, Maryland. She joined the UNCG Police Department as a student employee in 2005. After graduation, she became a full time telecommunicator in 2006, answering phones and dispatching calls to security and police officers. In 2010, she moved into the accreditation manager role, managing the CALEA accreditation process. In 2012, Kristi took on the responsibilities of web master for the Police Department and Clery compliance officer for the University. Campus Weekly will have a full post about this big, annual fundraiser concert later in the summer – but for those who want the best tickets, note that tickets will go on sale July 1. Dr. Donald F. Allen, professor emeritus of sociology at UNCG, died May 31. He joined UNCG’s Department of Sociology in 1962 and retired after 30 years of service to the university, his obituary notes. He taught social theory, social problems and sociology of religion courses. The full obituary may be viewed here. Spartan Athletics students had a UNCG Athletics record GPA for the 2017-2018 school year. The department GPA for 2017-2018 was 3.23. Women’s Golf led the department with the highest GPA for the academic year: 3.71. To begin the 2018 Faculty and Staff Excellence Awards Ceremony, UNCG Music students Detra Davis and Jacob Dishman presented Gershwin’s “Summertime.” And before the summertime begins, the university paused to recognize what Chancellor Franklin D. Gilliam, Jr. called the “extraordinary contributions” of this year’s honorees. “Today we recognize those who have put forth a sustained and innovative contribution to campus success,” Chancellor Gilliam said. The operative word is “sustained,” he explained. The honorees show excellence consistently, day in and day out. 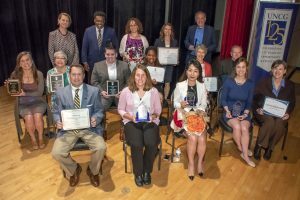 Eleven awards were presented by Chancellor Gilliam and Provost Dana Dunn during the ceremony, which was hosted by Associate Vice Chancellor Michelle Lamb Moore and Senior Vice Provost Alan Boyette. 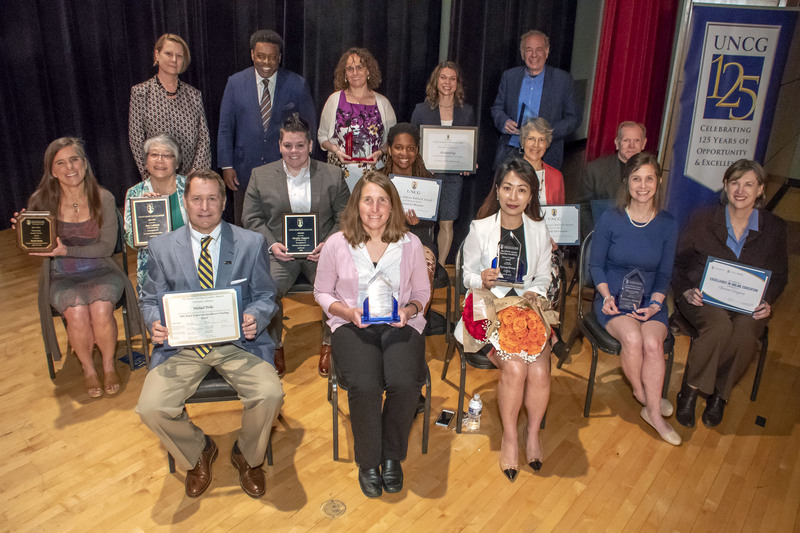 The chancellor and provost also made note of Staff Stars throughout the year and recognized faculty and staff who’d reached 30, 35 and 40 years of service. During the ceremony, the audience enjoyed films created by students in Dr. Michael Frierson’s advanced media practicum. The films highlighted the honorees’ areas of focus and their dedication to students. See more information, including past years’ recipients and videos, here. The UNCG Psychology Department is hosting the Kendon Smith Lecture Series on April 12 and 13, 2018. This is an endowed lecture series that brings internationally renowned experts to campus to speak about a common theme of interest. This year’s theme is “Post-traumatic Stress Disorder: From the Lab to the Clinic.” More information is available at: https://psy.uncg.edu/save-date-kendon-smith-lecture-series-spring-2018/. Betty Jean Melton Carter died Thursday, Jan. 25. He also notes that there were two prominent staff members named Betty Carter in that era. The recently deceased Betty Carter was in the Registrar’s Office, not University Libraries. Carter’s obituary may be seen here. The third conversation in this series will be Tuesday, Feb. 6, at 3:30 p.m. in the UNCG Faculty Center. The “Learning from Other Schools & Strategies” event will be a moderated panel discussion featuring UNCG Vice Chancellor of Business Affairs Charles Maimone, Steward Thomas from UNC Pembroke and John Pierce from UNC Asheville. Conversations on Sustainable and Socially Responsible Investing are sponsored by the the UNCG Sustainability Council. Check the website for more information on additional conversations. Friday, Jan. 26, 8 p.m., UNCG Art’s GPS, Lewis St.
Thursday, Feb. 1; Starts at 9 a.m.